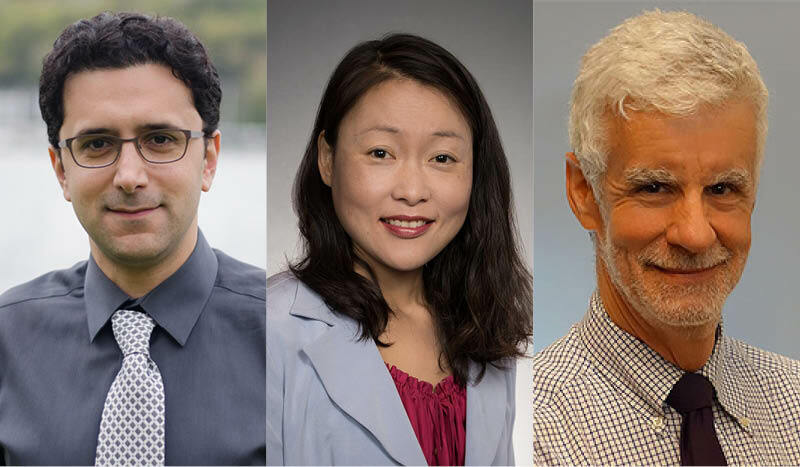 From left, Ali Rowhani-Rahbar, M.D., Ph.D., Mary Fan, JD, M.Phil, and Mark Sullivan, M.D., Ph.D., have been nominated for the 2019 Distinguished Teaching Award at the University of Washington. Several Harborview Injury Prevention and Research Center faculty have been nominated for the University of Washington Distinguished Teaching Awards for 2019. Violence Prevention section lead Ali Rowhani-Rahbar, M.D., Ph.D., core member Mary Fan, JD, M.Phil., and associate member Mark Sullivan, M.D., Ph.D., are all up for the university-wide honor. Recipients are selected by the UW’s Center for Teaching and Learning based on excellent in their subject matter, teaching students inside and outside the classroom, and innovation in process and curriculum design. Fan teaches at the UW School of Law, with a focus on instilling passion and creativity in her students as they learn how they can have an impact through their educations and careers. Sullivan was nominated as part of a team teaching in the UW School of Medicine’s Department of Anesthesiology & Pain Medicine. Winners will be announced in the Spring 2019 quarter. Training and education are core parts of HIPRC’s mission – learn more about our education opportunities.